Apply to be a QRC Staff member! 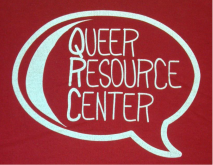 The Queer Resource Center is staffed by a small but dedicated group of students that are trained at the beginning of the semester in a variety of topics. Although staff members are required to stay for two semesters, many stay longer because they enjoy the work and the community. Time commitment is approx. 3-5 hours a week in office hours (depending on the size of the staff), and a 2 hour meeting. For more questions about managing the time commitment, please visit us during office hours.
" I love working for the QRC because I'm surrounded by a community of conscious and knowledgable people who want to create safer spaces for LGBTQ people on this campus by providing resources, and being present. I feel like I've found my Brandeis niche."